Floods in Myanmar have killed at least five people and forced tens of thousands to leave their homes, as heavy monsoon rains continue to batter the Mekong region, a government official said on July 29. 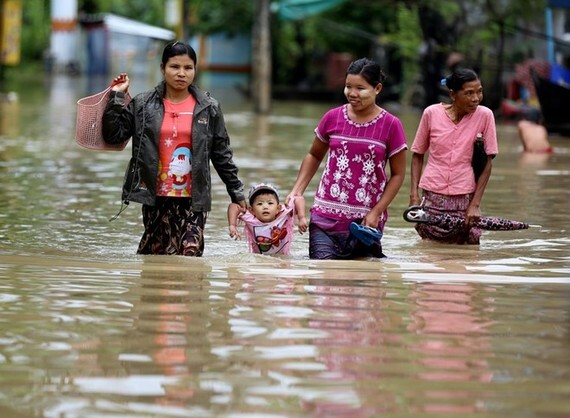 There are more than 54,000 displaced people affected by the flooding around the country, stated the official of the Ministry of Social Welfare of Myanmar. It is estimated that around 100,000 have been affected by floods. Vast areas of farmland completely submerged in muddy waters. Evacuation orders were issued in several areas, while some 163 camps have been set up for displaced people in southern, eastern and central parts of the country. Myanmar President U Win Myint on July 28 visited the Bago area in the central region to meet displaced people, while urging local authorities to set up temporary residence areas and provide locals with relief aid.